Have you heard? Amizade’s Northern Ireland Groups have worked in collaboration with Hear Me, an audio platform for student voices at Carnegie Melon University, to create something truly awesome. For the past two years, over 80 students from Northern Ireland have traveled to the U.S. for a week of service and learning through Amizade’s partnership with SEELB (South Eastern Education and Library Board) and Youthworks. During the program, students travel to D.C. to work with the homeless population, West Virginia to grow together as a team through ropes course activities at Adventure West Virginia, and to Pittsburgh for a short, yet pivotal, end to their trip. 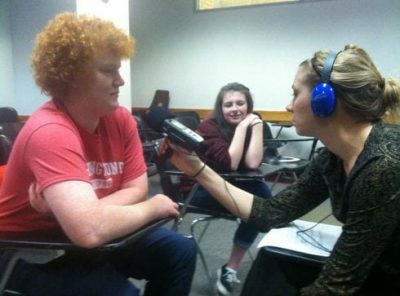 Hear Me engages Northern Irish youth through audio interview. Hear Me works with Amizade to design interview questions for students and uses basic audio equipment to collect stories. Once recorded, Hear Me edits the audio clips and catalogs them on their website. The stories are also placed in a kiosk so the students from Northern Ireland can physically take their reflections home to their communities. Amizade’s partners in Northern Ireland have been able to point to these kiosks as evidence of the profound transformation that is taking place on these trips. Listen to their stories here!